I couldn’t take my eyes off the woman seated in the middle of Pasquale Jones. She looked like one of those aging French actresses – short dark hair, fine bones – and she was eating a clam pizza all by herself. As she picked up each slice her eyelids would slide closed – almost involuntarily – as she bit into the soft, pillowy dough. Then the most extraordinary look would cross her face, one of deep satisfaction. Slowly, methodically, she ate the entire pizza. Watching her, there was no way you would not order one for yourself. I shared my pie – but it took a certain effort of will. 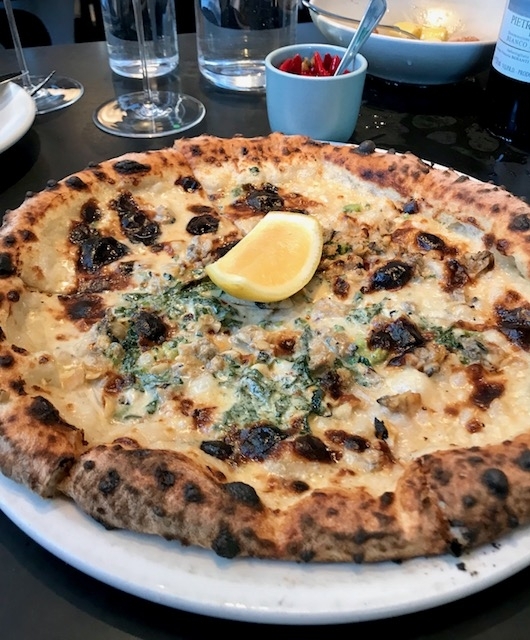 Pasquale Jones’ clam pizza – with its slightly charred crust, its lemon, its cheese and its broccoli rabe – is a thing of great beauty. And while I was exceedingly skeptical about the cream – that works too. Sprinkle on a bit of chile oil, and this is pretty much pizza heaven. But I have to say its hard to imagine anyplace I’d rather be on a frigid winter day than this cozy little restaurant with its wood-fired ovens, its lovely wine list and its fantastic food. 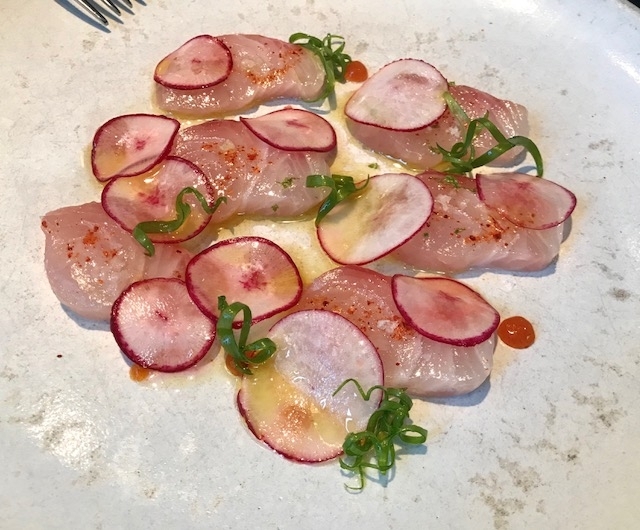 Ease in slowly, with a pristine plate of raw fish with radishes. A bit of wine, and you’ll never want to leave. There is, however, one compensation for leaving this little oasis: walk a few blocks south to Grand Street, go left one block and you’ll find yourself at my all-time favorite store, Di Palo’s. 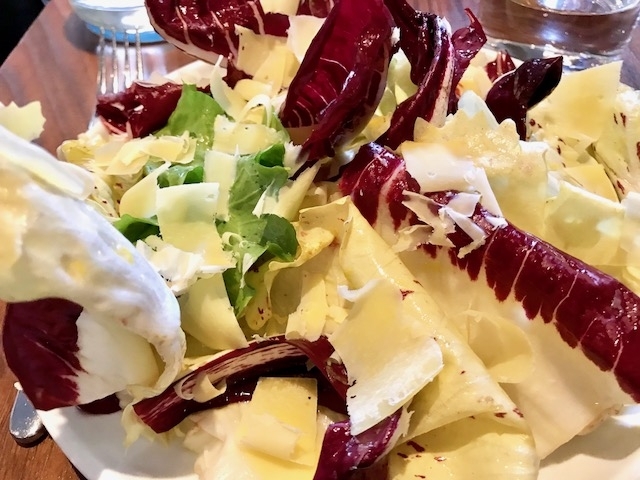 Plan on spending some time there as you buy ricotta, mozzarella, and the best Parmigiano in the city. This is not the time to rush. Found! A comfortable restaurant where you can actually have a conversation. That makes the new Fusco something of a novelty. Scott Conant has taken over the old Veritas space, turning it into a little oasis of calm. Look around; sound baffling materials surround you, the music isn’t blasting, you can’t hear your neighbors – and you find yourself relaxing happily into your seat. 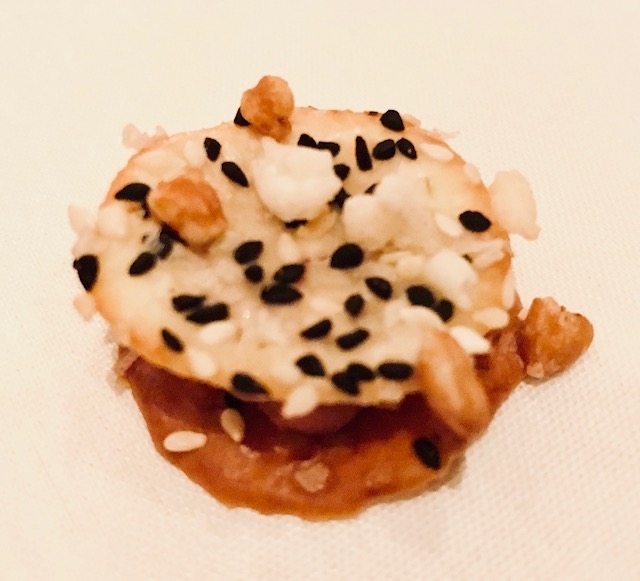 The man who’s famous for his tomato ragu is also cooking to a different tune here, making lapidary dishes that look more like jewelry than something you anticipate eating. 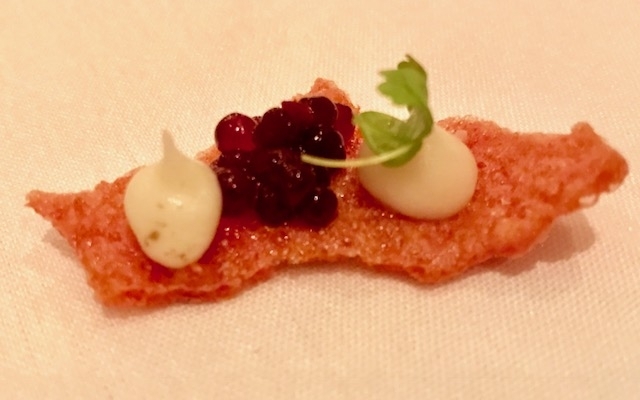 And his hamachi crudo comes topped with chiles, ginger and little pearls of finger lime. 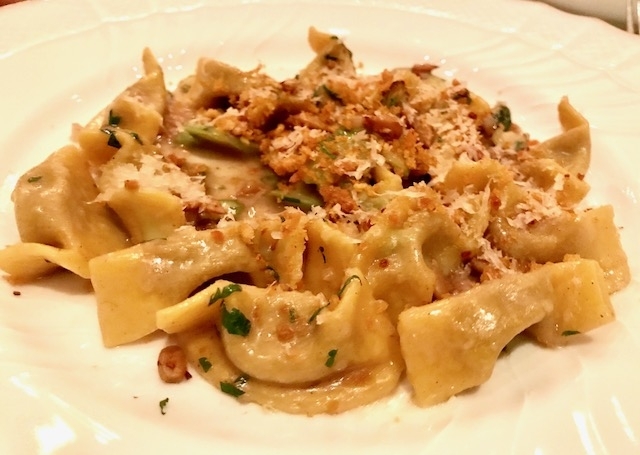 the chef is being wildly inventive, giving us a tour of Italy’s lesser-known pastas in some extremely unusual styles. 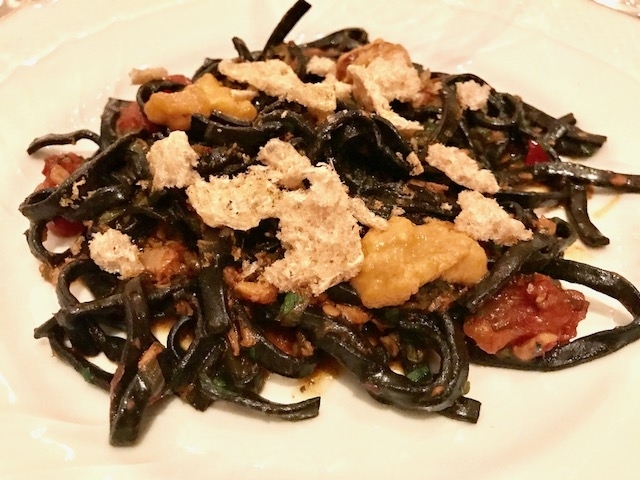 Consider squid ink scialatielli (that would be a thick, short version of fettuccine), which comes embellished with sea urchin, invisible (but very present) n’duja and pork belly whose skin has puffed up into startling little bits of crisp chicharron. 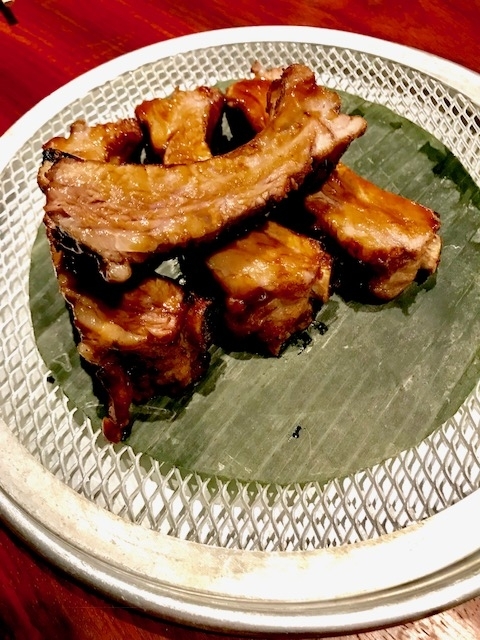 It’s a forceful and fascinating dish that changes with each bite. Spatzle is equally unfamiliar. 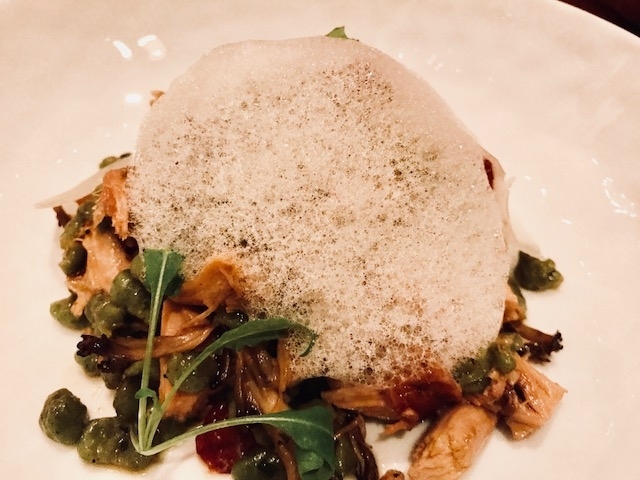 Mingled with rabbit, porcini and a hint of mint, the squiggles of dough come topped with foie gras foam. 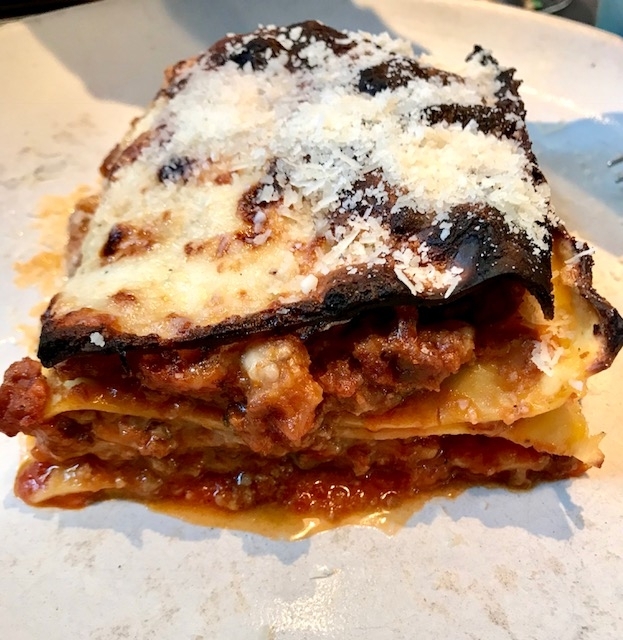 Casoncelli (tiny hand-made ravioli-like pockets from Lombardy) are filled with oxtail, sprinkled with fresh horseradish, and embellished with the crunch of crumbs. Surprising – and very delicious. There are also a couple of comforting dishes. 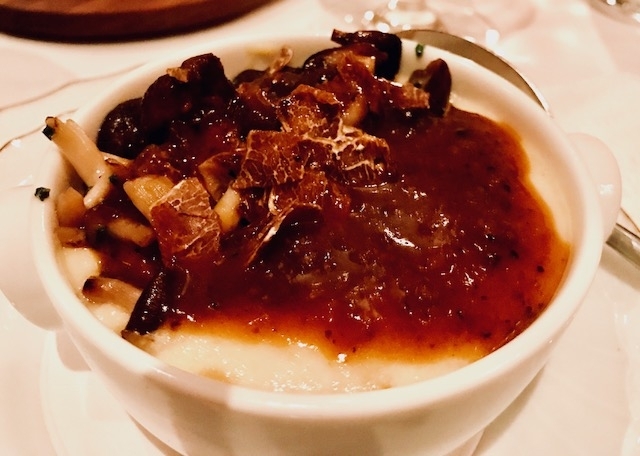 A great soft puddle of polenta is filled with mushroom and topped with a bit of truffle. Nobody has ever invented a better dish for this particular weather. 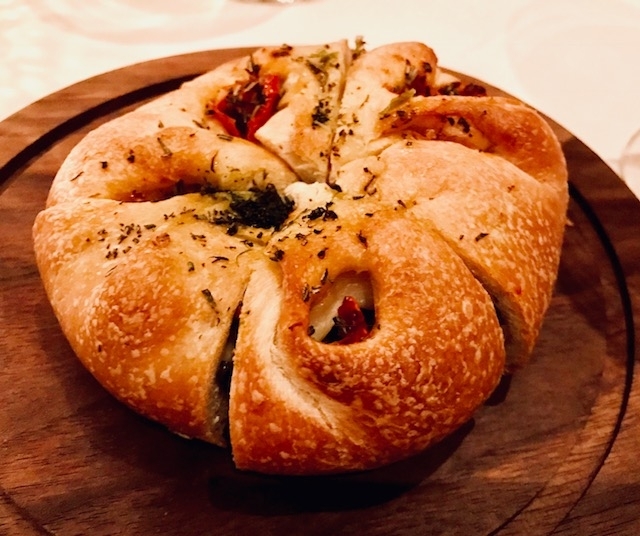 There’s also stromboli, a little round of bread stuffed with greens, salami and smoked mozzarella, which seems almost embarrassed to appear in this rarified atmosphere. The wine list leans toward Italy, and is filled with interesting bottles. And the service could not be nicer. Fusco offers Italy in a different mood; it’s a very pleasant interlude. One of those perfect New York days…. Long walk through Central Park to the Met to see the Hockney show. Such a bright spot on a gloomy day; this is art that fills you with hope for the future. 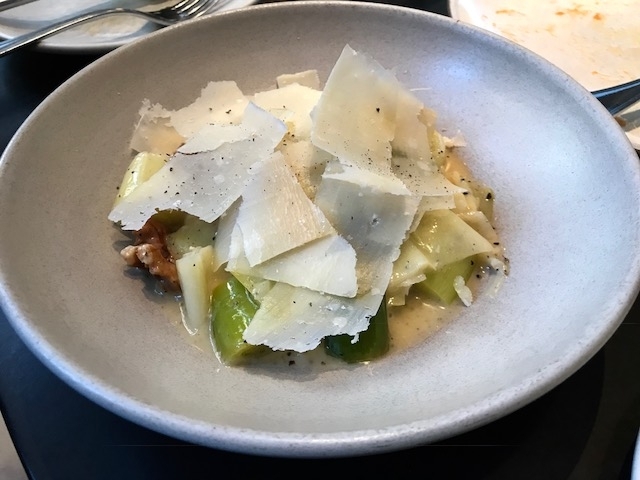 Then down the street to the Met Breuer, and lunch at my favorite uptown restaurant: Flora Bar. I love everything about this place, from the brutalist room to the minimalist menu. 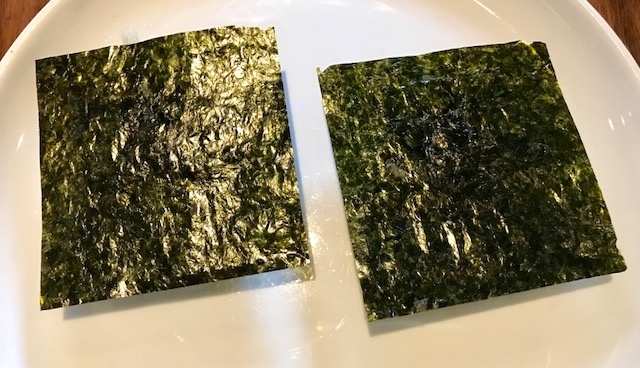 Hiding beneath those crisp, pristine squares of nori is a smudge of red shrimp and a squiggle of uni. 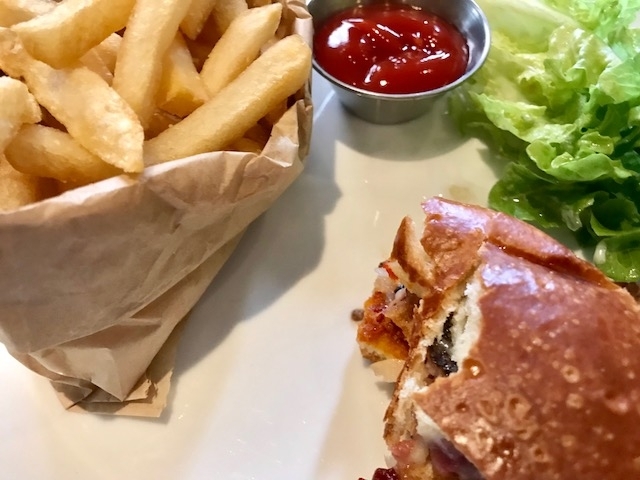 Roll it up – there is not a better bite in the city. A near perfect salad: chicories hiding an entire treasure trove of pears, walnuts and blue cheese. With a little bread, it makes a meal. 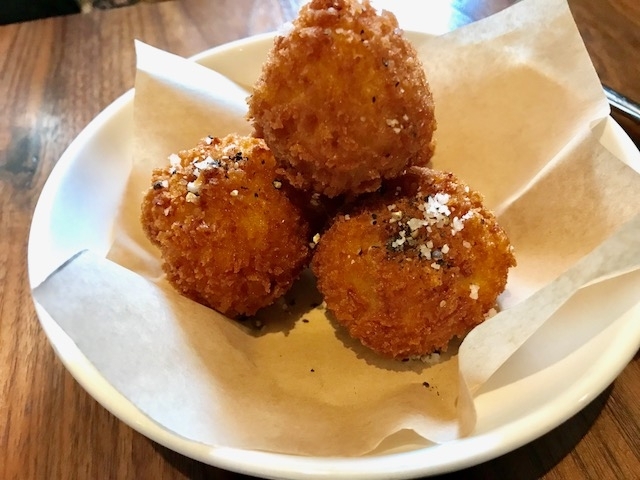 Crisp little croquettes filled with potatoes and raclette; a seductive take on a Swiss classic. Of all the fancy burgers in the city, this is one to reckon with. Wagyu beef with a soupcon of pepper marmalade, melted cheese, and a bag full of fries. But what makes this restaurant so impressive is the attention to detail. That little frizz of lettuce is so beautifully dressed! Headed upstairs to see the Kiefer show, and then the Munch show, and realized I’d done it all wrong. I should have reversed the order. You want to begin with dark northern despair and breast-beating, eat lunch, and then end with the joyous Hockney show. I felt much the same about food as I had about art: I did it backwards. I’ve been wanting to try Tetsu, Masa’s attempt to feed those of us who can’t afford the extravagance of his sushi palace. 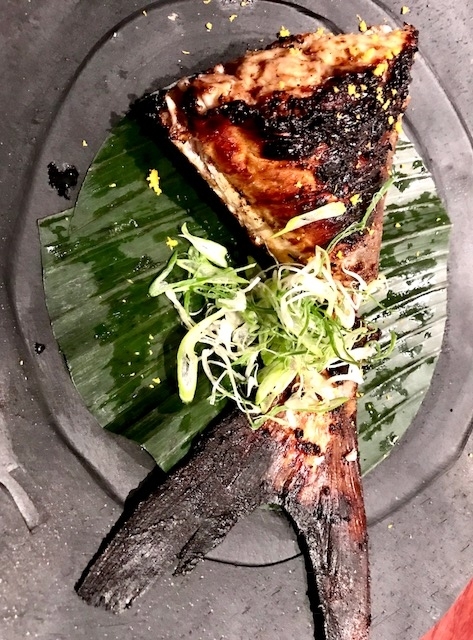 At Tetsu’s long bar – they call it a sushi bar, but it’s not – you can watch the frenzy of the open kitchen as chefs grill heads and tails (see the hamachi tail above) and construct skewers. The servers suggest 4 dishes per person (it’s all about sharing), which meant we ordered so much that by the time we were ready to end with a few pieces of sushi (this is, after all, Masa) we were already done. A disappointment, because other than that really wonderful yellowtail tail, the raw fish was by far my favorite. 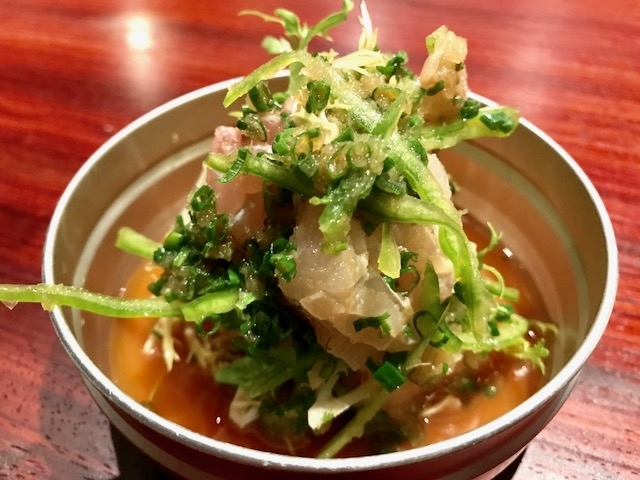 Loved this tai with ponzu. 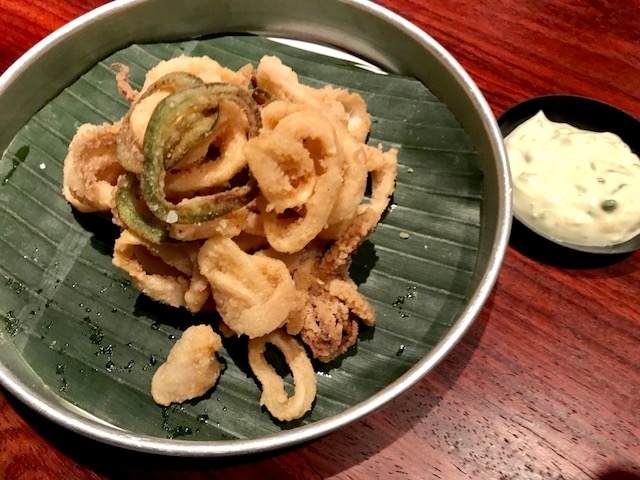 Fried calamari was nicely executed – but it was, in the end, fried squid. 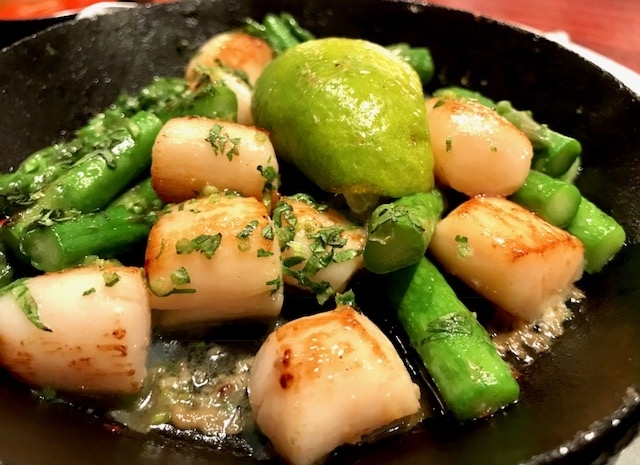 Scallops and asparagus – beautifully cooked but a bit lackluster. I suspect I’m being hard on Tetsu. I’ve been a Masa acolyte since I first found him in a Los Angeles minimall (his nearest neighbor was a Seven Eleven). 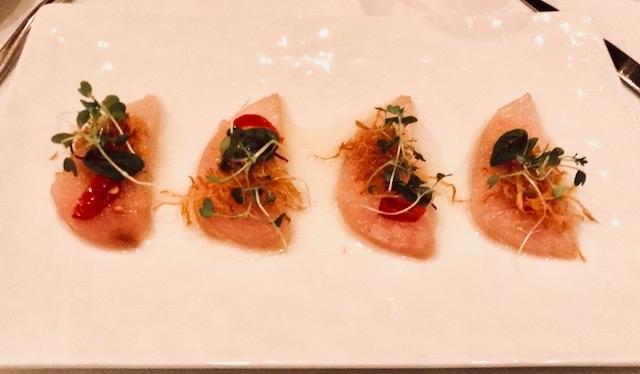 In those days – the mid-eighties – Masa was the king of sushi, flying off to Tokyo to source his fish, and when he went upscale I followed him to Rodeo Drive. And then to New York, where I’ve been lucky enough to eat at the Time Warner outpost a couple of times. I once asked Masa why he’d come to America, and he replied, “I wanted to see a flat horizon,” which pretty much tells you that this is no ordinary man. So I suppose I went to Tetsu looking for a trace of that creative imagination. What I found was a hip high quality restaurant, but one that lacks a driving personality. 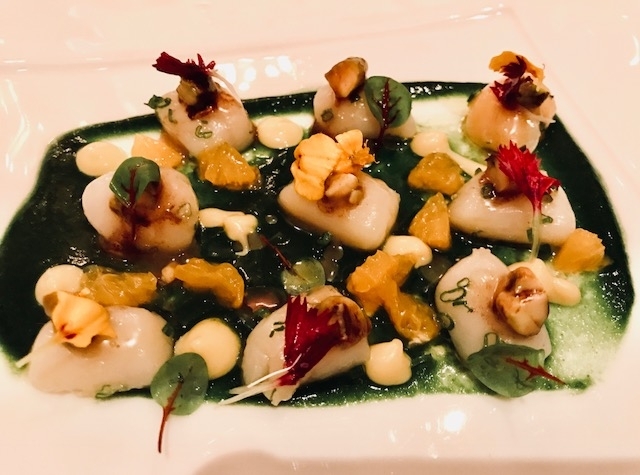 It’s quite a contrast to Flora which, in spite of being inside that cool, dominant architecture never lets you forget that behind every dish is an extremely original intelligence. I always leave there happy. New York, on New Year’s Day, was strangely vacant. The city sparkled – lights twinkling everywhere – but taxis scooted through empty streets, lights reflecting off the pavement. After the revels of the night before, most restaurants were closed. Which made the welcome at Union Square Cafe that much more appealing. It felt like a warm, bright oasis. 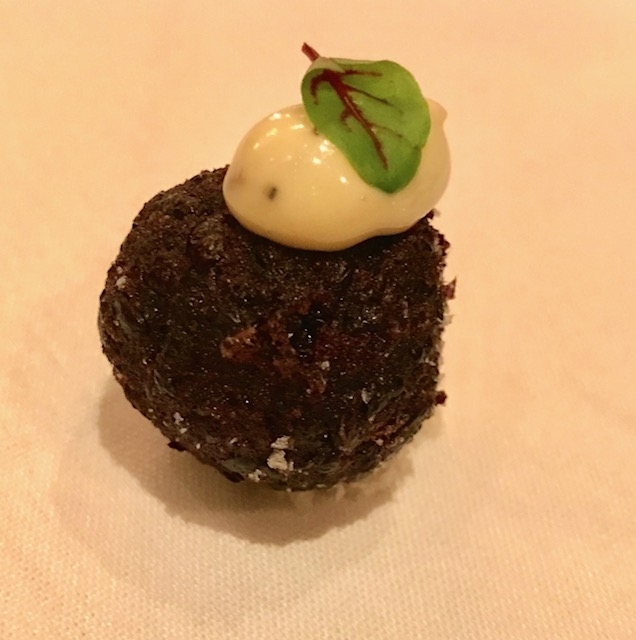 And the food was – for me at least – simple and perfect. 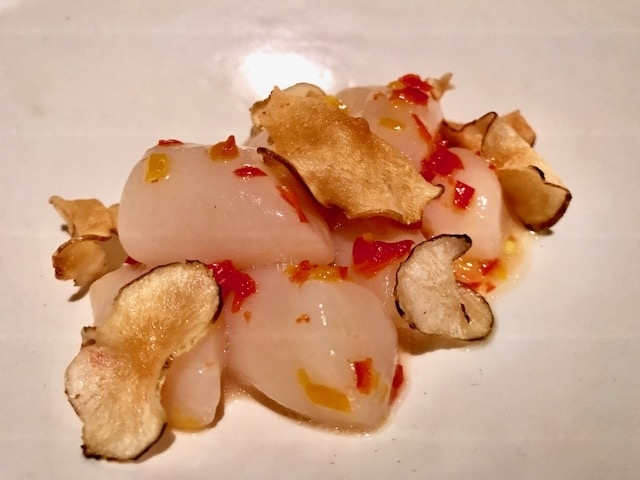 I began with the scallop crudo – above – tiny pristine Nantuckets, the popcorn of the sea, embellished with nothing more than pickled pepper and crisped sunchokes. The most wonderful seasonal treat. 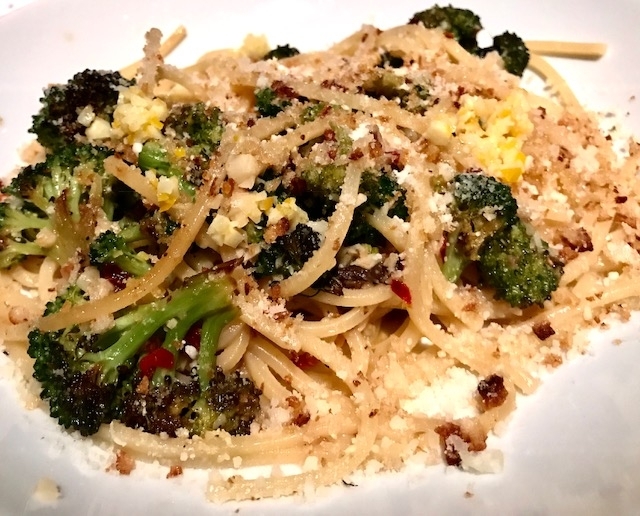 Afterward, a plate of pasta alla chitarra tossed with nothing more than anchovy, broccoli, preserved lemon and a hint of chile. A bit of cheese. 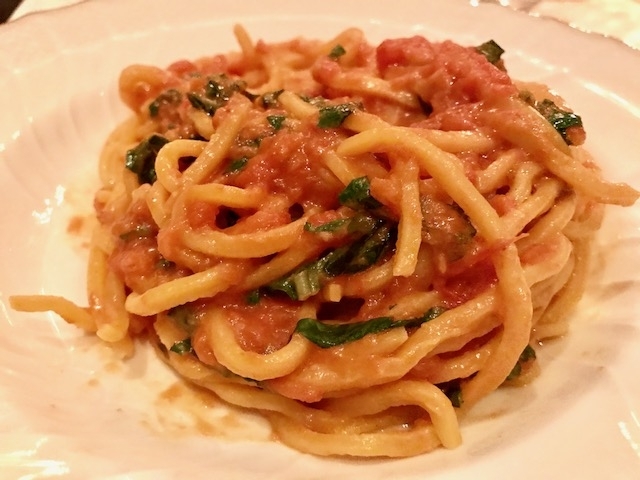 A reminder that, in Italy, it’s not the sauce that counts, it’s the pasta that has to shine. 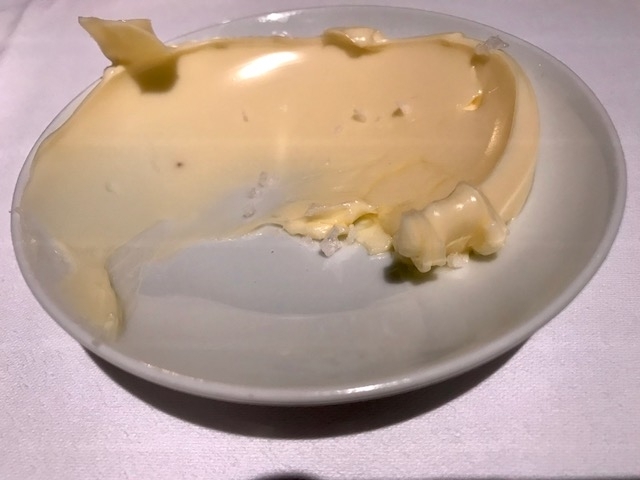 I’ve never seen butter served like this. But it was wonderful – as was the bread that came with it. Sorry this picture is such a mess. First Michael inhaled his hamburger, wearing the most beatific smile), then he attacked the mint chocolate chip ice cream with such speed I never got the chance to shoot it. 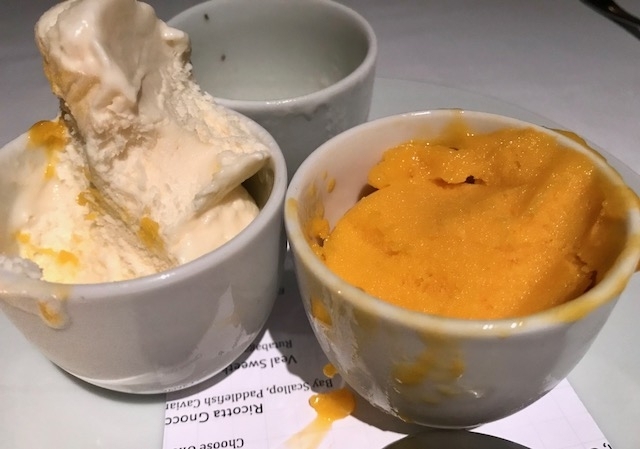 But I loved the combination of the mango/passion fruit sorbet with fior di latte ice cream. If you have happy memories of Good Humor creamsicles, this is the platonic ideal. And finally, the wine. Deux Montille Soueur et Frere, Rully Blanc, La Chaponniere, 2013. On this list it’s a Burgundy bargain. 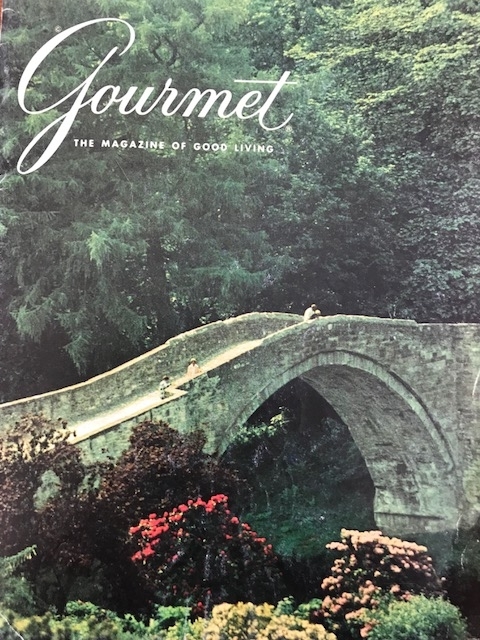 From the same issue as that tangerine croquembouche, here are some more appealing (to me at least) suggestions. 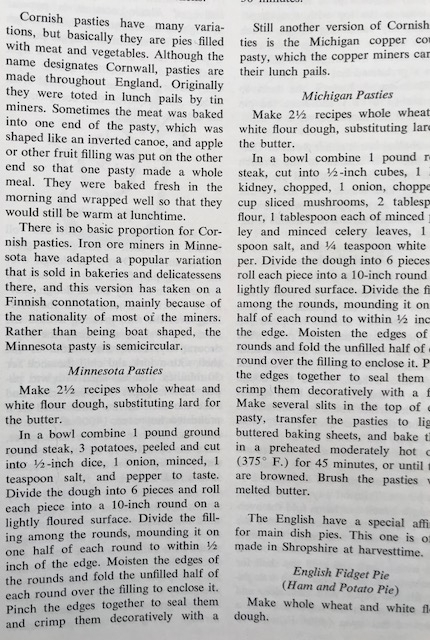 The article is called “European Entree Pies” and there are some very interesting recipes here….